Home > Wellness & Support > Residential Education > Student Conduct > For Students > "I received a letter from OSC"
"I received a letter from OSC"
"There is an issue I want to discuss"
"My professor sent me an academic misconduct letter"
Following receipt of an incident report, the Office of Student Conduct (OSC) will notify the alleged student (respondent) that a complaint has been received and will provide a list of alleged policy violations. The respondent is required to meet with OSC for an initial meeting. If you have received a letter instructing you to make an appointment with our staff to discuss an alleged policy violation, the following is what you can expect. During the Initial Meeting, an OSC staff member will share the information we have received related to the incident, and listen to your response. As the first step in MIT's disciplinary process, this meeting is your opportunity to share your perspective and respond to any alleged policy violations. Additionally, OSC staff will explain all the steps in the conduct process and answer any questions you may have. Following that meeting, you have a right to submit a supplemental response in writing if you choose. Call 617-258-8423 to schedule your appointment. Do not schedule your appointment during a time when you have class, a lab, or other academic requirement. If your schedule changes, you are sick on the date of your appointment, or you have another unforeseeable circumstance, contact us to reschedule. Consider what questions you have and think about what you want to say as your response to the letter. Review the letter you recieved and possible relevant policies, including the Mind and Hand Book. Consult the Rules of the Committee on Discipline. Gather any material or information relevant to the situation and bring it with you to the meeting. Decide if you want to bring an advisor to this meeting. Your advisor can be any person of your choice who is not an attorney or a member of the media, with the exception that attorneys are permitted to serve as advisors to complainants and respondents in cases involving allegations of sexual misconduct, intimate partner violence, or stalking. Your advisor can help you think of what questions to ask and how you’ll prepare going forward. If you are looking for an advisor, but cannot find one, contact OSC to be connected with a member of the OSC Advisor Program. Consider if you have any relevant witnesses. If you have a disability and need an accommodation, please contact Student Disability Services at 617-253-1674 or sds-all@mit.edu. If you would like assistance with language translation, please notify us so that appropriate arrangements can be made. Your initial meeting is typically a one-on-one conversation with the OSC staff member who sent the letter instructing you to schedule a meeting. The purpose of the initial meeting is for you to have an opportunity to respond to the incident report and share your perspective. Your response in this meeting will be considered during the resolution of your case. 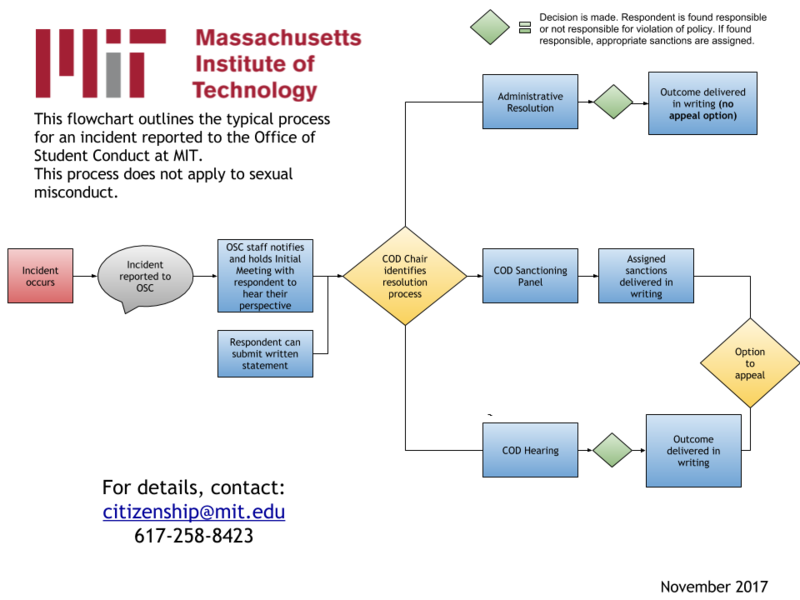 You will receive an overview MIT's student conduct process. You will have the opportunity to ask questions about the student conduct process, the alleged policy violations, and your rights as a student in the MIT community. You have the opportunity to submit a written response to supplement. If you choose to do this, you have 5 business days to submit your written response. After you have submitted your written response or the deadline to submit it has passed, the Chair of the COD will review your case and decide the resolution method. Most cases are handled via administrative resolution. In an administrative resolution, after reviewing the incident report and your response, the Chair will decide whether to find you responsible for the alleged violations. If you are found responsible for violating policy, the Chair will assign appropriate sanctions. You will be notified by letter of the Chair's decision. If the Chair does not select an administrative resolution, the case may be resolved via hearing or sanctioning panel. In that case, OSC will notify you and request an additional meeting with you to explain next steps. 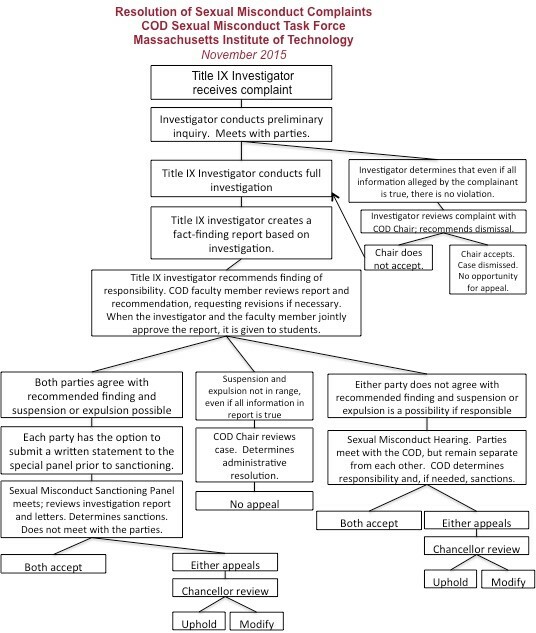 The Committee on Discipline (COD) receives and acts on three types of complaints: academic misconduct, personal/general misconduct, and sexual misconduct. There is a procedure to respond to each case that recognizes the elements unique to each type of case. The procedures for responding to all three types of complaints are described in detail in the COD Rules. The academic integrity process is described in detail here. The Office of Student Conduct is committed to the principle of equal opportunities for students with disabilities. If you have a disability and need an accommodation to participate in the COD process or any program or service offered by the OSC, please contact Student Disability Services at 617-253-1674 or sds-all@mit.edu.